"This pasta dish is not really risotto; it only refers to the similar technique used in that famous Italian dish. Like the grains of Arborio rice, pieces of broken pasta are tossed in hot butter or oil before the liquid is added, but here we're going even further, and toasting it to a gorgeous nut-brown. This gives the dish its signature look, as well as adds a subtle nutty flavor." Heat oil in a saucepan over medium heat; add spaghetti and toast, stirring constantly, until golden brown, 3 to 5 minutes. Stir garlic into spaghetti pieces and cook for 30 seconds. Pour in 1/2 cup broth and increase heat to medium high. Stir spaghetti and broth until all the liquid is absorbed, 2 to 3 minutes. Repeat this process until all of the stock is absorbed and noodles are desired tenderness, about 10 minutes. Reduce heat to low. 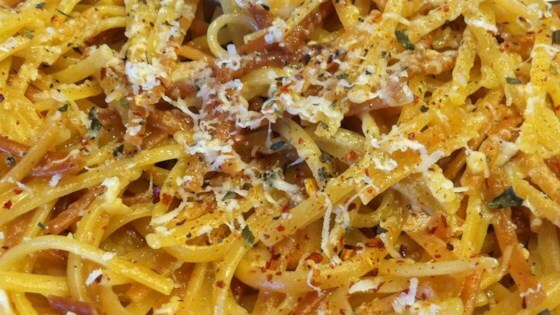 Season spaghetti with salt and red pepper flakes to taste. Remove from heat. Stir Parmigiano-Reggiano cheese and parsley into spaghetti and serve. See how to make a fast and super-easy pasta dish. We liked it! Quick, easy and made with ingredients readily available. Outstanding! I used 8 Oz. whole wheat spaghetti and 2 cans chix broth, and lots more garlic. We think that this could masquerade as wild rice! Here in Catalonia (Spain), this dish is called "fideuà"